pH Control Systems from Fortrans, Inc. Welcome to Fortrans, Inc., provider of powerful, high-quality pH control systems for an array of applications for customers in the USA and Canada. Our proprietary pH control and pH neutralization systems use carbon dioxide—or CO2—for pH control, lowering and neutralizing the pH of liquids effectively and automatically. Operating with cost-effective reliability, our CO2 pH control systems are your source for regulatory compliance and peace of mind. We encourage you to explore our site today to learn more about us, our pH control and neutralization systems, and the other products we are proud to offer. If you are seeking to learn more about Fortrans, Inc.’s quality aerators and aeration solutions, please visit our aeration website at www.fortransaeration.com. Ready Mix and Precast concrete producers generate high pH industrial process wastewater that has high levels of dissolved and suspended solids. 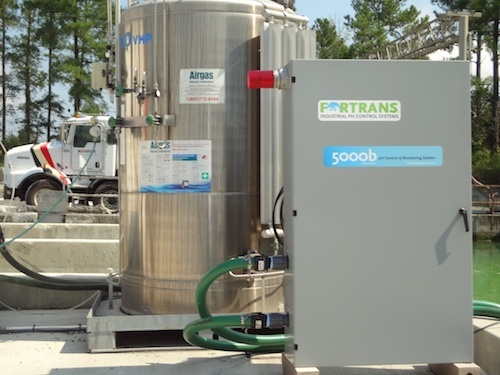 Fortrans Inc. uses a patented Di-Jet gas injector to dissolve low-cost carbon dioxide gas efficiently into process water or wastewater, thus lowering the process water’s pH. In this pH control application, conventional diffusers or injectors and aspirators may be subject to failure caused by solids build up in the devices. The Dif-Jet™ Injector is a more efficient pH control system, and it uses less carbon dioxide than spargers or diffusers. Fortrans’s Dif-Jet™ gas injectors allow use of safe, efficient, inexpensive carbon dioxide gas. Treating high-pH and high-solids wastewater with carbon dioxide also costs less than dosing with mineral acids such as sulfuric or hydrochloric acid. Sulfuric acid may actually increase total suspended solids requiring a separate filter before discharge. Pictured Right: Fortrans Model 5000B pH control and monitoring system installed at a ready-mixed concrete plant. System does not include the large CO2 tank. A huge benefit of treatment with a carbon dioxide-based pH control system is that the carbonic acid produced by carbon dioxide will react with the calcium hydroxide created from cement and produce calcium carbonate, which is not soluble in water and will precipitate out of the water. The TSS of treated water is typically 7 mg/l to 15 mg/l, well below the EPA standard of 30 mg/l for discharge. Treated water can replace fresh water at truck wash racks, batching of fresh concrete or irrigation. Treated water may also be returned to municipal wastewater systems. Carbon dioxide is far less expensive than granular pH reducers such as such as sodium bisulfate or citric acid. Lowering pH with carbon dioxide is inherently safer for personnel by eliminating handling of hazardous materials. Reporting requirements on hazardous materials required by the EPA and local agencies are greatly reduced or eliminated. Specialized storage and spill containment equipment is not necessary for carbon dioxide storage. Carbon dioxide is not corrosive to sensitive equipment such as circuit boards in PLC’s and other electronic controls. Dif-jet gas injectors are incorporated into self-contained pH control systems complete with control instrumentation and full enclosures or skid mounted for interior applications. All systems are basically “plug and play” requiring only a supply of carbon dioxide gas and a regulator. Fortrans, Inc. offers unique pH control systems that you won’t find anywhere else. Our patent-pending Dif-Jet injects carbon dioxide (CO2) directly into high-pH water in a highly-efficient process. When it comes to CO2 injection systems, none can match Fortrans, Inc.’s cost effectiveness, reliable function, and minimal cleaning and maintenance demands. We hope you will browse our selection of C02-based pH control systems to find the perfect CO2 injection system to meet your facility’s requirements. All of our products are available to companies in the United States and Canada. If you have questions, or if you’d like to place an order, fill out the form to your right or call us at 866-958-7267. Tony L. Sample, Carolina Sunrock LLC. "Lane Construction Corporation uses technology that provides solutions to uphold our commitment to Environmental stewardship. This is why we use Fortrans, a proven leader in the construction wastewater industry. Through our experience, Fortrans provides equipment that is sound in construction, operation, and maintenance. This is further complemented by good customer relations and technical support for a reasonable price."